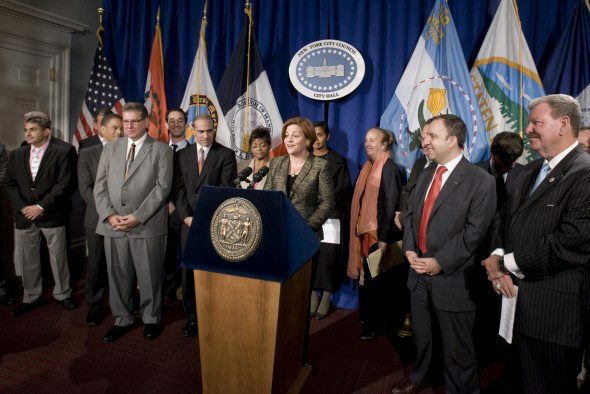 New Legislation developed by the City Council and Mayor will eliminate unnecessary obstacles that hinder business growth City Hall, NY – Today, City Council Speaker Christine C. Quinn, Committee on Small Business Chair Diana Reyna, Council Minority Leader James S. Oddo, Committee on Government Operations Chair Gale A. Brewer, Council Member Inez Dickens, Deputy Majority Leader Leroy Comrie, Small Business Services Commissioner Robert W. Walsh and Chief Business Operations Officer Tokumbo Shobowale announced several measures to ease the regulatory burdens on the city’s small businesses. These measures are a result of the Regulatory Review Panel, a joint effort by the Mayor and the City Council to scrutinize City regulations and how they are developed and make recommendations to recast them, eliminate unnecessary obstacles that hinder business growth, and enhance public participation in rulemaking. These new measures follow up on and further the initial 14 measures announced by Mayor Bloomberg and Speaker Quinn based on the Regulatory Review Panel’s April 2010 recommendations. Speaker Quinn was also joined today by Assembly Member Michael DenDekker, Robert Bookman and Andrew Rigie of the NYC Hospitality Alliance, President and CEO of the Brooklyn Chamber of Commerce Carlo A. Scissura, Manhattan Chamber of Commerce President Nancy Ploeger, as well as representatives from New York City small businesses including second generation newsstand operator Bernard Uhfelder, Paul Seres of the Lower East Side restaurant the DL, Jeff Bank of Carmine’s, former Brooklyn business owner Vinnie Mazone, and Farid Lancheros of Bogota Latin Bistro in Park Slope. • Identification of violations for which businesses should receive a warning or opportunity to cure the violation instead of an automatic penalty or fine. • Elimination of obsolete violations. • Streamlining of regulatory processes; Simplification of the Place of Assembly permitting process.